A hate crime suspect allegedly attacked a man with a guitar in Santa Barbara County on April because he believed the victim was gay. The victim suffered a serious injury in the attack, during which the suspect was shouting a homophobic slur, according to the county sheriff’s office. At about 1 p.m. on April 15 near Highway 101 in the Arroyo Quemada area west of Refugio State Beach, a man beat a 63-year-old Santa Paul man. The victim suffered a traumatic injury that required medical treatment, according to a sheriffs office press release. In the weeks following the attack, deputies attempted to identify and locate a suspect. 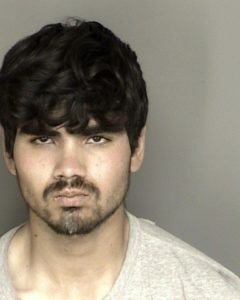 Eventually investigators identified 19-year-old Daniel Joseph Garcia of Isla Vista as the suspect. After obtaining an arrest warrant, investigators determined Garcia was in custody in Monterey County. Sheriff’s officials say, several hours after committing the hate crime, Garcia was arrested by CHP officers in Monterey County for an unrelated assault with a deadly weapon incident, as well as for DUI. Authorities will transport Garcia to Santa Barbara County to face charges after the conclusion of his Monterey County case. Most homophobes are closet cases and he is now in a men’s prison so chances are that is not snot. Is that a snot stain on his lip and chin?